Suggestions on a timber finish? 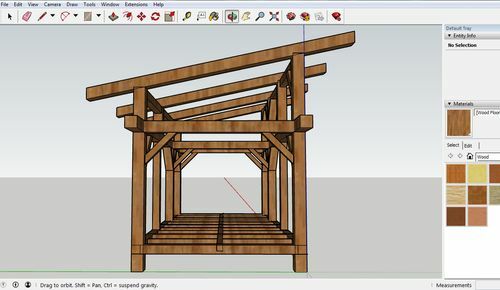 So I am building a post and beam workshop that will be 12’x20’ in my backyard. I have access to a lot of 6”x6”x8’ white oak beams for super cheap ($10 each!) and they are beautiful….or will be after I clean them up a hair. I had planned on treating them against moisture and pests the old fashion way grandpappy used to with a mixture of used motor oil (strained with a tshirt to get all the crud out of there) and diesel or turpentine to help it penetrate. After letting it sit for several days, there is no smell and it is fire retardant, moisture resistant, and pest resistant. We’ve always used this for fence posts but never for posts or beams that a structure would be used for where people would be in in it. Would you coat it with anything to make it fire/water/pest resistant? Leave it as is? If coat with something….what? I’d like to leave it as natural looking as possible. I guess the first question would be – how exactly how will you be using the beams ? is that what you call an Oxymoron ?? dried wood + motor oil + diesel + turpentine = fire retardant ?? BORG has all kinds of deck and fence stains that are clear or tinted – you might want to read up on those. Yes sir, I have….mainly because I’m a natural skeptic like you! ;-) So did my dad and his dad. I’m sure you know that gasoline and/or diesel doesn’t burn. The FUMES from the fuel burn. When you spray this diesel/oil mixture on the wood, let it sit for several days to a week. This gives it time to release the fumes (the volatile component of the equation) and keep what’s left to preserve the wood. Gas is worse than diesel since it has a higher octane and is therefore more volatile. Diesel is much more stable as it burns at a lower octane (cetane) which is why i’ve used it as opposed to gas. So when the old timers would use fuel for this preservative, it was used as a penetrant that helped the oil get deeper into the wood. I found this great youtube video that shows someone testing it. BTW, the foundation that I’ll be using is not pictured in this screen shot. I’m crap at sketchup, so i just winged it to get a general idea. awesome – I hope you document your progress. 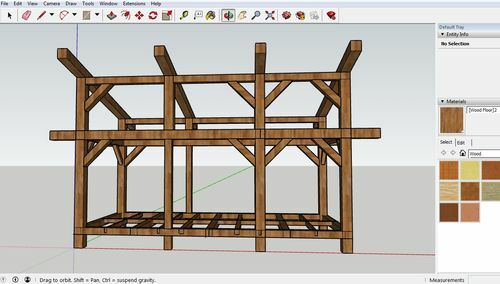 looks like a good candidate for some moderate Timber Framing techniques. will be on the inside ? if so, then I would just leave the oak beams in their natural state for now. after the construction is complete – then you can re-evaluate coating them with something. for me personally, I would not want good looking white oak beams looking and smelling like railroad ties. BTW: have you checked your local building codes and permit requirements? good luck in your project !! What you propose will work – 2 generations of your family did it, but I would not use it in an enclosed space. Your shop will smell like motor oil- diesel forever. Use an appropriate wood finishing oil with driers. Like stated before the box stores have all kinds of deck oils and stains, many transparent with some dye, that will tint whatever shade and provide protection. Gracias sir! I’m looking forward to it. Great points you’ve made. I think I’ll leave them as is!